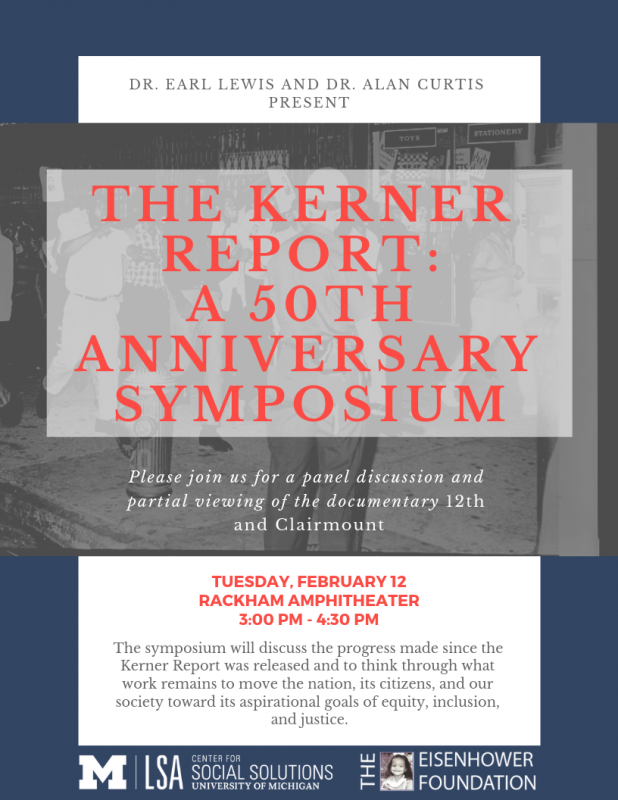 The event will include some footage from the 12th & Clairmount documentary about the 1967 Detroit rebellion; comments by Earl Lewis, director of the Center for Social Solutions, and Alan Curtis, president of the Eisenhower Foundation; and a panel discussion of experts to include discussion of the Detroit context and the update of the Kerner Report published in 2018. The 1967-1968 urban uprisings and rebellions in several American cities shone a bright light on the complex social, economic, and racial problems of the 1950s and 1960s. In response to those uprisings, President Lyndon Johnson convened the National Advisory Commission on Civil Disorders in 1968. 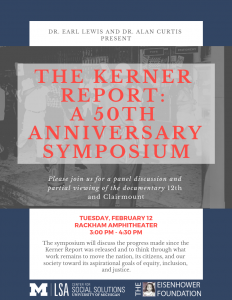 The symposium will convene a group of scholars, policy analysts, and political thinkers, and community participants to discuss the progress made since the Kerner Report was released and to think through what work remains to move the nation, its citizens, and our society toward its aspirational goals of equity, inclusion, and justice. The participants and panelists will be charged with placing their focus on identifying those political strategies and public policies that have been effective toward those goals. Moreover, they will also be charged with helping symposium participants and interested constituencies to begin think through feasible ways to move public and political discourse away from outmoded, polarizing, and ineffective ideas and policies. While much social and civic good has been achieved since 1968, this symposium will take a hard and sober look at the emergent trends toward political polarization, social and economic disparities, and potential threats to ethical and democratic norms. We anticipate raising many questions, but we also intend to leave with proposals for moving our nation forward.